hello, merry christmas and holiday season. we have reached the magical amount of 50 releases. let this be our christmas present from us to you. heh.. it only took us approximately 3,5 years but if you watch behind now, you’ll hear the overcoming quality in every release and that’s something. also something to announce is that our aminet resident has moved to a new, much better location. from now on you’ll be able to get the lha versions from the ‘mods/vdo’ directory in aminet. 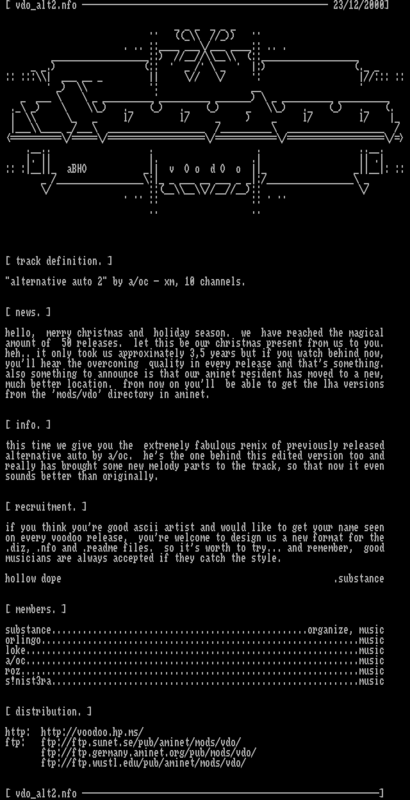 this time we give you the extremely fabulous remix of previously released alternative auto by a/oc. he’s the one behind this edited version too and really has brought some new melody parts to the track, so that now it even sounds better than originally. if you think you’re good ascii artist and would like to get your name seen on every voodoo release, you’re welcome to design us a new format for the .diz, .nfo and .readme files. so it’s worth to try… and remember, good musicians are always accepted if they catch the style.